Fishermen wait on the bank of the Union River in Ellsworth on Tuesday morning. The elver fishing season officially started at noon, and people were staking out their spots for their nets. 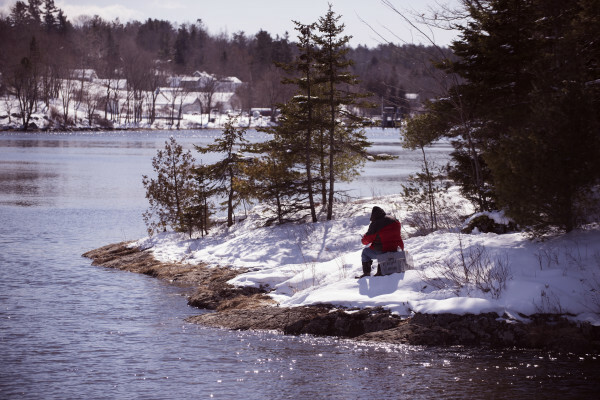 A fisherman waits on the bank of the Union River in Ellsworth on Tuesday morning. The elver fishing season officially started at noon, and people were staking out their spots for their nets. Babe Stanley, 87, walks out to the spot he fishes for elvers in Franklin on Tuesday morning. Stanley was one of the many fishermen who staked out their spots before the noon start of the 2016 elver fishing season. One of the stakes that will be used to anchor Babe Stanley's elver fishing net in Franklin. Stanley was one of the many fishermen who staked out their spots before the Tuesday noon start of the 2016 elver fishing season. 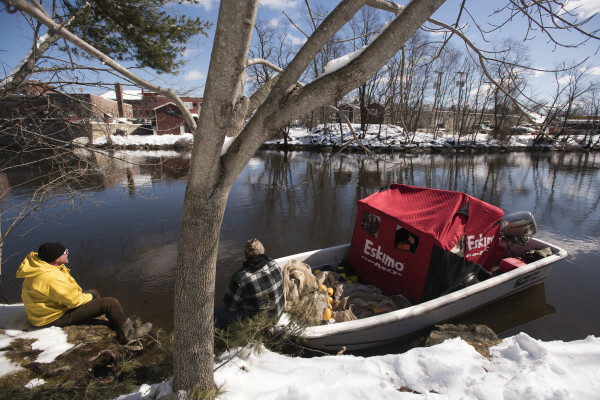 ELLSWORTH, Maine — Along the banks of the Union River on Tuesday morning, between the boat launch on Water Street and the Leonard Lake dam, more than a dozen elver fishermen were staking out their spots, waiting for noon to come so they could set up their nets along the banks. More than 10 miles away, in a marsh at the edge of Hog Bay in Franklin, lifelong fisherman Babe Stanley had the banks of a tidal stream all to himself — except for robins darting about and a fox that ran up a nearby hillside. 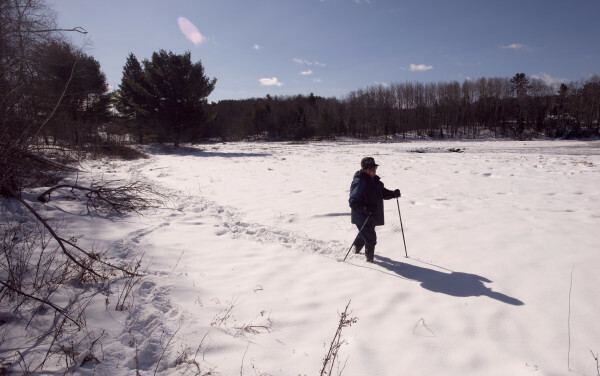 Stanley, 87, trekked through ankle-deep snow that morning from Route 200 to a bend in the creek where he usually sets his nets to await the start of Maine’s 2016 elver season. He said last year, when Maine fishermen on average were paid more than $2,000 per pound for their catch, he and his son Shane Stanley caught only about half their shared quota of roughly 36 pounds. Because of the mild winter this year, he hopes they will catch their full quota before the season ends in late May or early June. Prices fishermen get for their elvers usually start out lower than where they wind up the season before, but on Tuesday, dealers and fishermen alike were not publicly disclosing where the price was expected to start out this year. Speaking generally, some said it could be as low as $800 per pound while others said it could be $2,500 per pound or higher. Stanley said he did not know what kind of prices he might be able to get for his first haul. He said he typically hangs on to his catch for as long as possible and then sells it toward the end of the season, when competition among dealers causes prices to climb. 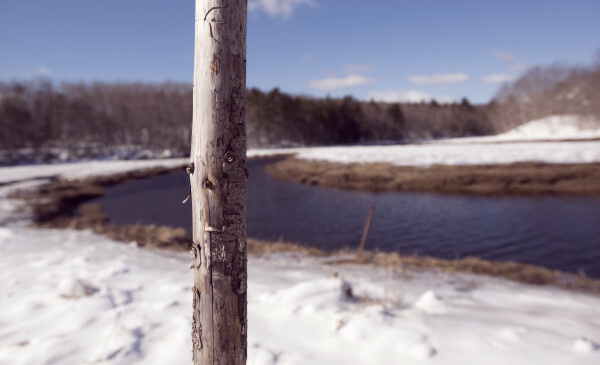 On the banks of the winding tidal stream in Franklin where he stood, the wooden and metal stakes he, his son and grandson use each spring to secure their fyke nets were still there from last season, pounded into the mud and ice-flattened grass. Stanley was waiting for his son to arrive with the large funnel-shaped nets so they could spread them out on the nearby embankment and get them ready. The tide was high at midday Tuesday, and Stanley said they would have to wait until low tide Wednesday morning to put their nets in place. They have to wade across the stream to tie the nets to more stakes on the far side that help keep the funnel-shaped net open, he said, and can’t do it when the water is deep. Stanley, who grew up in South Gouldsboro but now lives in Sullivan, has been fishing since he was 10 years old. He said he got hurt while lobster fishing last summer and was laid up for several weeks, missing out on the autumn months, when lobster catches tend to be heaviest. He said his 2015 lobster income is running low, and he is counting on his 2016 elver income to get him through to the summer, when he expects to start setting traps in July. “That’s the plan. If it don’t work out, I’m going to be a lot thinner than I am now by the time lobster season comes,” he said with a chuckle. Not all elver fishermen were feeling jovial on the first day of the season, however. According to Jeff Nichols, spokesman for the Maine Department of Marine Resources, two fishermen were arrested around noon Tuesday after an altercation on the banks of the Orland River. Robert Royce of Hope and Steven Richardson of South Thomaston were arrested, and each faces a charge of assault, Nichols said, after they got into a confrontation with a Blue Hill fisherman over a fishing spot on the riverbank. They are due to appear in court in Ellsworth in June, he said. Despite the sometimes fierce competition in the fishery, Bill Sheldon, a longtime elver dealer from Woolwich, said last week he expects 2016 to be a good year overall for people in the industry. He said he thinks the next several years should see the fishery expand in value and volume. The statewide quota imposed by the Atlantic State Marine Fisheries Commission in the fall of 2014 should be increased, Sheldon said. The cap of 9,688 pounds for all Maine fishermen is “low and conservative,” he said, and was put in place in reaction to unusual circumstances in the fishery that have not lasted. Sheldon added that concerns and unknowns about the health of the American eel resource led the interstate commission to set a harvest cap on the heels of the two most productive elver fishing years ever in Maine, in 2012 and 2013. Elver fishermen harvested 21,000 pounds and 18,000 pounds of elvers respectively in those two years, netting statewide gross revenue totals of $40 million and nearly $33 million respectively. The catch totals those two years were unusually high because of abnormally warm late winter weather, he said. But despite the subsequent catch limit, Maine fishermen only caught a little more than half the statewide quota in 2015, when the late winter and spring were fairly cold. “They are affected more by the environment than they are by fishing [pressure],” Sheldon said of elvers. The elver dealer added that untold scores of elvers die from exposure or predation by swimming into coves that do not lead upstream to the rivers and lakes, where they would grow into adult eels. Conversely, large quantities do make it upstream in the St. Croix and Kennebec rivers, which, because of gear placement restrictions and to the rivers’ underwater topography, have large sections that are virtually “unfishable,” he said. State law restricts elver fishing to tidal sections of rivers, prohibiting the harvest of elvers above the high tide line. Sheldon said the statewide quota was set purposefully low, at a time when the American eel was being considered for possible protections under the federal Endangered Species Act. The 9,688-pound limit would have been justified if scientists had determined the species was threatened or endangered under the federal law, but now that those concerns have been shown to be unfounded, he said, the cap should be raised. The immediate increase that would make the most sense, according to Sheldon, would be raising the statewide limit to 11,749 pounds, which was the cap for Maine’s 2014 harvest. But he said it could be raised even higher, which would help expand the economic impact of the fishery in Maine without harming the resource.